Drive In is an exhibition about cars, showing the approach of this subject by numerous photographers, from the fifties to nowadays. When Elliott Erwitt, during and after the depression era, photographed those rolling dreams with his candid sense of humor and irony, cars, especially the very large and imposing ones, were already a landmark in the American landscape. When René Burri travelled to Brazil to document the building of modern cities, one of his most stunning photographs, «Men on a roof top, Sao Paulo, 1960», is a view of the rush hour traffic on a busy street. 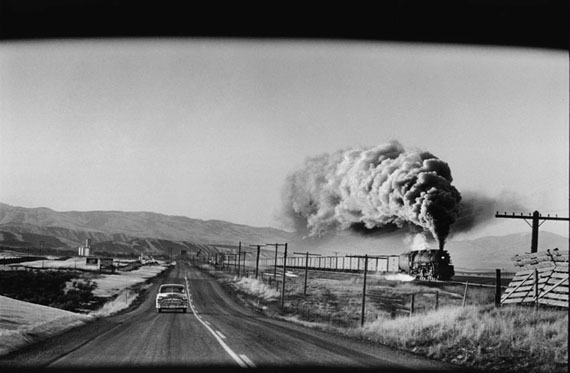 Simone Kappeler, another Swiss photographer, drove through America in 1981, 30 years after her fellow countryman Robert Frank, and took pictures with her Hasselblad, a Polaroid and cheap toy cameras like Diana. 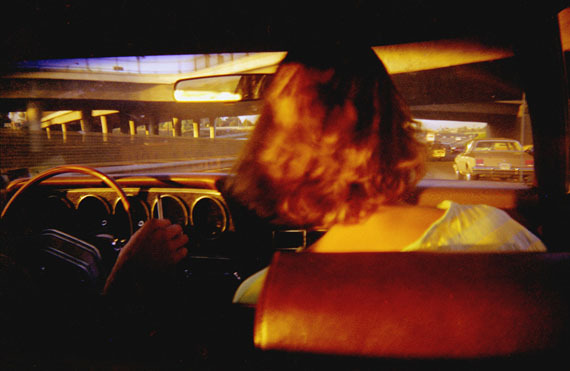 She saw America in color, influenced by American movies and photography. Symbol of the American dream, of the rise of the middle class and of individualism through the whole XXth century, cars appear in a great amount of photographies. With the rise of Street Photography, cars were bound to peep out on most photos taken. Still cars are photographed not only as a transportation device through the packed streets of cities or in the great outdoors emptiness but also as a traveling place of intimacy in the public space, where people talk, eat, sleep, love, as in a ever moving home. For photographers, cars are elements of decor, mechanical sculptures with their own modern esthetic, frames that echoes the camera’s viewfinder but also boxes where small scenes take place between people as in a moving theater. 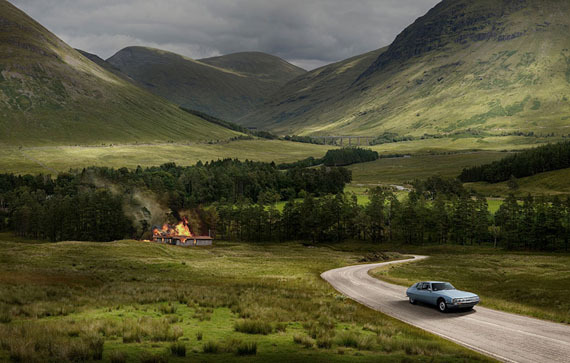 Cars ends up belonging to a cinematographic imaginary and become a subject for their own esthetic qualities of machines and the symbolic of speed, power and freedom they convey. Als Symbol des amerikanischen Traums und dem damit verbundenen Aufstieg der Mittelklasse im 20. Jahrhundert ist das Auto seit den 50er Jahren in der Fotografie allgegenwärtig. Es dient als Transportmittel im Chaos der dicht befahrenen Strasse als auch in der Weite und Leere der Landschaft. Es ist aber auch Rückzugsort, ein Ort der Intimität, in den man sich aus dem öffentlichen Leben zurückziehen kann, in dem Menschen sprechen, essen, schlafen und sich lieben. Die Gruppenausstellung zeigt Arbeiten von 26 namhaften amerikanischen und europäischen Fotografen von den 1940er bis heute: René Burri, Lillian Birnbaum, Nicolas Dhervillers, Elliott Erwitt, Leonard Freed, René Groebli, Maurice Haas, Léon Herschtritt, Thomas Hoepker, Claudia Imbert, Simone Kappeler, Jason Langer, Xavier Lambours, Tobias Madörin, Gérard Musy, Axel Martens, Inge Morath, Hans Peter Riegel, Emil Schulthess, Paul Senn, Louis Stettner, Sam Shaw, Arthur Tress, Burk Uzzle, Raffael Waldner und Bruno Augsburger. Als Eliott Erwitt während und nach der grossen Depression in Amerika Autos als rollende Traumgebilde fotografierte – mit dem ihm eigenen Humor und Sinn für Ironie – war das Auto bereits nicht mehr aus der amerikanischen Kultur und Landschaft wegzudenken. René Burri reiste in den 60ern nach Brasilien, um den Bau moderner Städte zu dokumentieren. 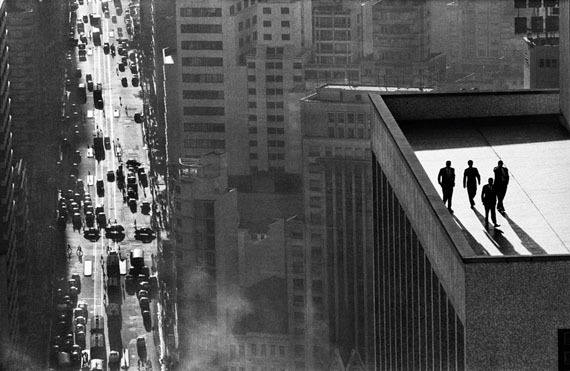 Eine seiner bekanntesten Aufnahme "Men on a rooftop, Sao Paulo, 1960" ist der Blick von einem Dach hinab auf vier Silhouetten, der Feierabendverkehr hinter und unter ihnen. Die Schweizer Fotografin Simone Kappeler reiste 1981 durch Amerika, 30 Jahre nach ihrem Lands- mann Robert Frank, und übersetzte ihre Reise fotografisch mit einer Hasselblad-, einer Polaroid- und der billigen und damals neuen Diana- Kamera. Sie sah Amerika in Farbe, beeinflusst vom amerikanischen Film und der Fotografie der 60er Jahre.